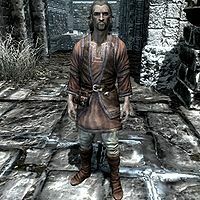 Calixto Corrium is an Imperial rogue living the life of leisure in Windhelm. He used to go adventuring with his sister Lucilla until she passed away. After that, he settled down and opened Calixto's House of Curiosities to put on display the assortment of curiosities he had collected, such as The Book of Fate and Ysgramor's Soup Spoon. At one point, he was a member of the College of Winterhold. For more information, see the lore article. Calixto wears a set of merchant clothes along with a pair of boots. He wields an iron dagger and carries Calixto's key along with a selection of upper-class loot and gold. When you enter his house during opening hours, he will give you a warm welcome: "Welcome to the House of Curiosities! I offer a brief tour for a few coins, or you can simply browse at your leisure." You can then ask him how he assembled to his collection: "My sister and I inherited a modest sum of money. We decided to travel and seek out whatever adventures we could find. As we journeyed across Tamriel, we encountered tales of exotic and wondrous artifacts. We decided to collect as many as we could. My sister passed away some years ago, so I settled down here and opened the House of Curiosities. I think she would be happy to know that our collection has brought smiles to faces both young and old." If you ask him if he mentioned a tour he will respond: "Indeed I did! For a few septims, I'll tell you about some of the most interesting curiosities in my collection." If you reject his offer, he will say: "Very well. If you change your mind, you can usually find me here. In the meantime, feel free to look around." If you accept his offer, he will be happy: "Splendid! If you'll just follow me, I'll tell you tales and show you wonders such as you've never seen." Calixto will then get out of his chair and walk over to a set of shelves with various embalming tools: "These tools were found in a crypt outside Windhelm. They belonged to the ancient Nords who dwelt in Skyrim before the days of the First Empire. Most scholars believe that the Nords of old used these implements to prepare their dead for burial. What macabre mysteries would these tools reveal if they could but speak?" On the next set of shelves sits The Book of Fate: "Here is the Book of Fate, discovered in a secret room in the Arcane University. The writing in the book describes the destiny of its reader, so the words change from one person to the next. Some see only blank pages, and nobody knows why. Perhaps some of us are born with no destiny, or maybe the blank pages signify an imminent death." The next curiosity is Ysgramor's Soup Spoon: "Ah, now here is an item out of legend. This is Ysgramor's Soup Spoon. Now, I know what you're thinking - this is no spoon, it's a fork! Nobody can eat soup with a fork! Well, my friend, you did not know Ysgramor." He will then proceed to the next odd item, the Dancer's Flute: "Don't let this innocent-looking flute fool you, for this is the Dancer's Pipe. Legend holds that the Dancer's Pipe has won wars, toppled empires and changed the very course of history. None know its origins, but the stories say that men who hear its music are compelled to dance uncontrollably, no matter the peril. To activate this strange power, one must only speak the magic words, which are... Oh my, I very nearly got us both into a nasty predicament, didn't I?" He will then end the tour with a farewell: "And with that, the tour is over. I thank you for your patronage, and I hope to see you again soon!" Calixto becomes unessential when he draws his blade during the related quest. This page was last modified on 25 May 2015, at 23:11.